November marks Pancreatic Cancer Awareness Month when people come together to raise the profile of pancreatic cancer. According to Pancreatic Cancer Action, a UK based charity working towards the day when people survive pancreatic cancer and patients have the best treatment available, pancreatic cancer is the UK’s 5th biggest cancer killer. approximately 10,000 people are newly diagnosed each year. 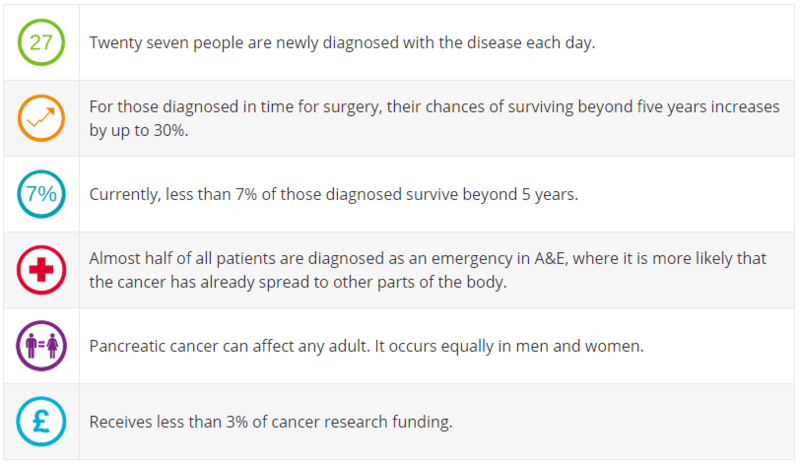 Pancreatic cancer affects men and women equally with incidence increasing from the age of 45. The average age at diagnosis is 72. Ali Stunt, the founder of Pancreatic Cancer Action worked with E4H on an inspirational project to produce a short film dedicated to her story. The film was produced to show the human story to pancreatic cancer, the human beyond the treatment and how life can go on again after a devastating diagnosis. Ali’s appreciation for life and family is heart-warming and incredibly moving. Pancreatic Cancer Action says that he five per cent survival rate of pancreatic cancer has barely changed in nearly 50 years. However, with earlier diagnosis, this could change. To play your part, you can donate to the charity to fund research, educate healthcare professionals, increase awareness and support patients.